Part of the appeal of coming to the north of Greenland, I have no qualms in saying, was to discover the remnants of a way of life that might be labelled "exotic". However, it would be misleading to suggest that all the Polar Eskimos here belong to a culture which could be called "hunter-gatherer". Nowadays, the majority of the people in Qaanaaq live as we do with more or less the same amenities. Seventy-two people own a hunting licence in the Thule region and most of those are part-time hunters. 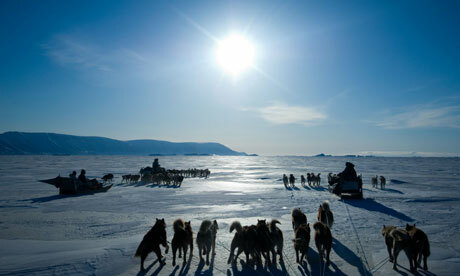 The number of hunters travelling by dog-sledge across the frozen sea in search of sea mammals is therefore tiny and represents an insignificant threat to wildlife. Their traditional way of life is vanishing not because of global warming, but because the Self-Rule Government has caved in to the pressure and threats of environmentalist groups. The Polar Eskimos feel misunderstood, and it is not difficult to see why. Not unreasonably, they feel that environmentalists ought to focus on the world's major polluting countries which pose a real and significant threat, and not on small indigenous groups who live precariously and take the bare minimum from the land and the sea. The only people to exploit the riches of these Arctic seas were the European whalers of the 19th century who drove many species to the point of extinction. Arriving with their infectious epidemics, such as measles and influenza, they nearly wiped out the indigenous population, too. Despairing about the prospects for hunting, some people have turned to Greenland halibut fishing instead. This seems like a sensible development and I am intrigued to see how good the ice fishing is here. Curled-up dogs lie in large circles on the hummocky shore ice, their rusty chains leading from a spike frozen into the ice like spokes on an old, buckled wheel. Jaundiced patches of urine and dog faeces decorate the ice, tampering with its aesthetic of purity. Beyond, the newly snow-covered sea ice stretches as far as the eye can see. The much anticipated nigeq, a strong wind from the east, brought a platonic white carpet of snow and warmer temperatures at the weekend. The appeal of this white wilderness is tangible and I have been exploring it on skis, armed with a rifle and a VHF radio. Today I have the company of a hunter and a full team of 12 frenzied dogs whose fettered anguish is about to be set free. Trying to put harnesses on snarling, hysterical dogs soon degenerates into mayhem, with fights breaking out amid a chorus of high-pitched screams and yelps. The hunters' whip skimming over their cowered heads silences the pandemonium, and then suddenly we are on our way and I am left to sprint after the rapidly disappearingnapariaq (the pair of wooden stanchions at the rear of a sledge). There is something majestic about the sight of a solitary Polar Eskimo driving a dog team across the frozen sea ice, navigating his way around icebergs, sitting contentedly, listening to the crunch of the runners on the snow and reading the wind from the striae on the ice. The appeal is perhaps its primeval simplicity, but also its timelessness. Far in the distance sits an i'duaq (a hut built on a sledge where you can escape the cold on fishing trips): a small speck on a landscape of white nothingness. In this part of the bay, the sea ice is about a metre thick and making a hole in the ice with a shovel is hard work. We drop a line from an industrial-sized reel attached to a two-handed winch standing vertically on a metal frame in the ice. Twenty-five hooks are lowered 200 metres down into the fjord. Then, it is time to retreat to the warmth of a Primus stove and a cup of tea in a tiny plaster board hut measuring no more than 7ft square. Approaching the hut, I hear the creaky voice of a man and offer the traditional greeting of inugguarunai on entering (this is a word used by older people to mean "hello", but means literally "look, there are some people" – an indication perhaps of how language reflects culture). Going inside this diminutive raised room perched on a sledge is a surreal experience and one of those defining moments of a fieldwork trip. Here, miles from anywhere on the frozen sea in a forgotten place, lies a man asleep on a skin on the sleeping platform. Three men, clad in bearskin trousers and reindeer-skin anoraks, sit huddled together listening to a storyteller regale his company with an account of a polar bear hunt. It is rude to interrupt a story, and thus my greeting is not reciprocated with the conventional ahukiaq. There is nowhere to sit and even though my head rests awkwardly on the ceiling of the hut and my bulky down coat fills the little remaining space, I feel paradoxically rather invisible. When stories are offered for payment, it is tempting to think of this oral literature as commoditised and in effect dead. But, here on hunting trips, these traditions do just about continue in an unforgettable atmosphere of breathy voices lingering over steaming cups of cha. The story over, it is time to check our lines, leaving the fugitive hospitality behind. We have caught 17 Greenland halibut and one northern wolffish: a splendid return for two hours' tea-drinking. The Polar Eskimos do not tend to be intellectually curious. Seldom does anybody ask about the place I come from. However, sometimes I am asked how many people live in the United Kingdom. The Greenlanders are well aware that they inhabit the country with the lowest population density on earth, but I always feel embarrassed to admit that over 60 million people are crammed into our little island. Greenland is a country nine times the size of the UK, but the population of the UK is more than a thousand times that of this vast island in the Arctic. The subsequent question, normally, is how I could live in such an overcrowded, multicultural, polluted place where the bond to nature is not only severed, but no longer understood either. The reason for the embarrassment on my part is perhaps because I know that the industrialised country that I come from is a comparatively major polluter whose economy and thirst for economic growth jeopardises indirectly an ancient, simple way of life whose demands on the natural environment are almost zero. Before coming to the Arctic, I was convinced that we needed a new paradigm for looking at the world. We have reached the point where the pursuit of economic growth at the expense of everything else can only lead to ruin for mankind. We need to develop a system which would turn this model on its head, forcing investors to allocate funds and reward companies, and indeed countries, not solely for their respective growth in earnings or annual percentage increase in GDP, but directly and quantitatively for their progress in having developed green, sustainable products and economies. Having spent much time talking to the Arctic hunters who bear the costs of environmental damage, I am convinced of the need for a new approach to assessing what we consider to be "economic success", and also for the introduction of urgent policies to curtail the world's population growth. A country with 1.4 billion people and an annual economic growth rate of 10% (China) should not be hailed as a success story if it is building a new coal power station every week and causing untold damage to the environment. That is in effect the view of the Arctic hunters and one which I endorse. Later on this year, the population of the world will reach seven billion. The pernicious combination of this uncontrolled population growth and the finite mineral resources of the planet are undoubtedly the biggest threats to the environment. Unless we take appropriate action and implement policies on these fronts, the disappearance of a small, isolated culture in the Arctic may be a microcosm for a much more apocalyptic outcome. For many, it may seem irrelevant if we lose a culture numbering fewer than a thousand people, but if the Polar Eskimos come to be the canary in the cultural coalmine, then such a loss may have more relevance than some people feared. If I were to be asked what it is these Arctic hunters want, I would say "peace". This is a people that have never known war. But, by "peace" I would mean not just an absence of war but a return to what you might call in Rousseauesque terms "harmony". There are people in the Thule region that believe the industrialised, polluting nations are living in a state of disharmony with nature, gambling with the world's future by seeking nothing but material gain for themselves in the short term. The ice is melting. The melting ice will presumably wipe out the traditional culture of the few remaining Arctic hunters in my lifetime, but ultimately, if not stopped, it will threaten the lives of millions around the world. The politicians keep talking, but the ice just keeps melting and the inescapable conclusion will not go away. The hunters look at the thinning sea ice and their message is simple: the clock is ticking. Stephen Pax Leonard is an anthropological linguist at the Scott Polar Research Institute and a research fellow at Trinity Hall, Cambridge. His research is funded by the British Academy and the World Oral Literature Project in Cambridge.